I found yoga–or yoga found me– in 2001, during my first visit to Maine from Poland. I remember being instantly drawn to this transformative and healing practice. 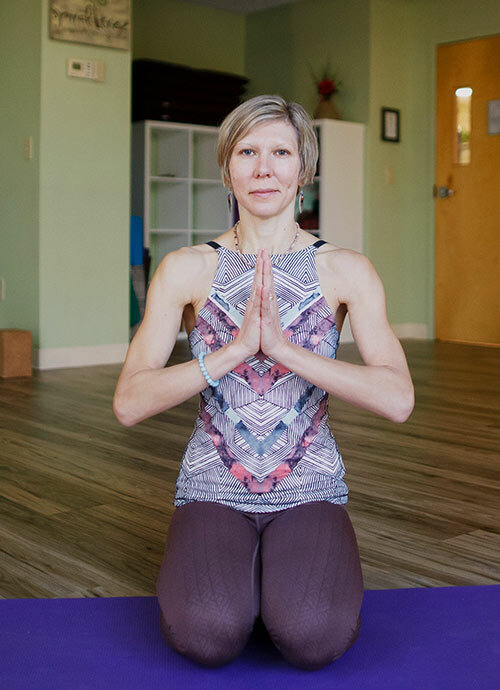 I completed my initial 200 hour Vinyasa teacher training with Jennifer Cooper and Sandra Pleasant in Virginia and since then have studied with many teachers including Sean Corn, Shiva Rea, Jacqui Bonwell, Amy Wren, Nicole Clark and many others. I hold 40 hours Pre-Natal Training with Still Point Healing Method and also Shiva Shakti School of Yoga. I’m also a certified children’s yoga and mindfulness instructor with Childlight Yoga and have additional training in trauma-sensitive yoga and mindfulness work with children and adults. Additionally I’m trained in yoga Nidra and Thai yoga bodywork levels 1 and 2 with Shiva Shakti School of Yoga. In 2012 I opened Spiral Tree Yoga and Wellness Studio in Portland, Maine where I offered a diversity of programs for adults, children and families. During that time I also completed an additional 300 hour training with Daniel Orlansky and Yoga of Energy Flow, which included studying with Doug Keller (yoga therapy), Josh Summers (yin yoga), and Todd Norian and Jennifer Reis (yoga Nidra). I officially transitioned from ownership of the studio in September 2018 and currently offer classes, workshops and private sessions in the Greater Portland area and also overseas in Poland. I also trained in the Stott Pilates Method and continue to study Pilates with exceptional local teachers within the field. My practice is supported by my undergraduate degree in Health Science (minor in Holistic Health) and a graduate degree in Recreation and Leisure Studies, and is complemented by my study of Ayurveda with The Institute of Ayurveda in New Mexico. I am also a Usui Reiki Master. My teaching style is heart driven and focuses on your unique individual alignment, while allowing you to move in tune with your own breathing and in touch with your intuitive wisdom. I work with you on ways of bringing the practice of the mat into your daily life, of building and meeting goals, and of making the practice accessible. As I teach and work from my heart I help you to connect to your heart wisdom. I’m constantly grateful to all my teachers and students for their endless inspiration and wisdom so I can continue to grow and evolve. I believe in the healing power of yoga and community and it is my mission to bring my own experience into my practice, to be a source of healing for others. When not teaching I enjoy spending time with my family. I’m a mom of two children–Natalia and Konrad. I love spending time with them, my husband Brian and our pets Koko (cat) and Luna (dog). Hiking or being on the beach or in nature is my favorite, along with travelling (especially to Poland), cooking, going to theater and musicals, and dancing.